International and domestic banks are spreading the net ever wider in their efforts to bring financial services to China’s increasingly wealthy population. China has outdone itself. The country’s economy grew by 11.5% in the first three quarters of last year, a year that almost certainly will have seen China clock up the fastest growth rate in more than a decade. Capital markets continued their blistering pace of growth, with the Shanghai composite index almost doubling in value in 2007. In October the stock market frenzy allowed five Chinese companies to grab spots on the list of the world’s 10 biggest companies by market capitalization. The wealth creation also pushed the number of billionaires in China up to 106 from just 15 in 2006 according to the Shanghai-based Hurun report. Chinese banks continued to ride the wave of enthusiasm, posting tremendous profit growth and raising money through share offerings and mutual fund sales. Loan portfolios became more diversified, with banks focusing more attention on personal loans and small and medium-size enterprise (SME) lending. Building off the country’s capital market growth, China’s securities firms also had a phenomenal year after spending much of the past decade in the doldrums. Foreign banks made significant progress as well. For the first time, the government allowed foreign banks to offer yuan-based retail banking services to Chinese customers. Some of these banks are now offering credit card and wealth management services as well as innovative programs for SME lending and rural finance. Foreign banks also advised on international mergers and acquisitions and worked on IPOs. Despite all the good news, challenges remain. Rising inflation is one of the most serious of these challenges. China’s consumer price index (CPI), which remained steady throughout years of strong growth, picked up steam in 2007 and hit an 11-year high of 6.9% in November. There is much debate over the significance of this CPI statistic. Shortages in pork and other agricultural products caused large food-related price increases, which in turn pushed the index higher. Prices of many products, however, remained stable. For many observers, this indicates that the current round of inflation will pass once the food shortages subside. While the food-related shortages may pass, expectations of higher prices could persist. These expectations, combined with China’s monetary conditions, could transform the cyclical increase in food prices into a more dangerous inflationary trend. “The fear that I have,” continues Bottelier, “is that inflationary expectations may take over. If that happens, you may get a self-fulfilling promise because the liquidity to sustain high CPI inflation is there.” The central bank can loosen or tighten liquidity in the banking system through monetary policy, but it has only limited control over liquidity in the hands of the public, he emphasizes. Continued inflation has consequences for China’s banks. If deposit rates do not keep up with inflation rates, then bank customers will receive negative real returns on their deposits. This would encourage these customers to withdraw money and buy goods or property to store value. Banks draw much of their profits from the sizable fixed margins on deposit and loan rates. If they lose deposits, they will lose their loan-making capabilities, and profits will suffer. At the same time, because of the yuan’s relatively rigid exchange rate, higher interest rates will bring more foreign money into the country. Foreign investors can benefit not only from the deposit rate but also from the yuan’s appreciation. This foreign money, however, will bring more monetary liquidity to the system, potentially worsening the inflation problem. Most observers, including Bottelier, think this scenario is unlikely, but regulators must watch their steps carefully. China’s rapid growth actually complicates regulators’ jobs further. If the economy grows too quickly, the country could face a substantial downturn once that growth finally slows. China’s policymakers have avoided this hard-landing scenario for several years, but the rapid GDP growth suggests that the danger remains high. Those worried about this hard landing point to the country’s capital markets. In addition to the Shanghai composite index almost doubling last year, after more than doubling in 2006, the numbers of IPOs and new investment accounts increased dramatically, and the Shanghai exchange raised more money in IPOs last year than any other exchange in the world, including the New York Stock Exchange. The rapid rise of the capital markets and their increasingly integral role in management of savings and corporate fund-raising would magnify the effects of any drastic declines. China’s stocks are already significantly more expensive than similar stocks in other markets, in terms of price-to-earnings (P/E) ratios. The effects of a stock market crash, considering the large number of individual investors, would spread across many aspects of the economy. Similarly, real estate prices have increased rapidly for several years. For banks, real estate loans make up a huge portion of loan portfolios. Worries of a bubble in the real estate market have persisted for many years, and recently some markets have witnessed declining prices. A drastic drop in real estate prices would hurt not only construction companies and real estate developers but the banks from which they borrow and the raw material and equipment suppliers from which they buy. Worries over inflation, an overheating economy and the potential for a hard landing led banking officials to raise interest rates six times and reserve requirements 10 times in 2007. Zhou Xiaochuan, the head of China’s central bank, posted a new year’s message on the bank’s website pledging to maintain a tight monetary policy. That tight policy will likely include more rate increases. Some worry that this tightening stance may actually threaten stability rather than promote it. This tightening could be especially dangerous if the US economy continues to slow, a scenario that many believe is likely. China exported almost $270 billion in goods to the United States in the first 10 months of 2007, according to the US Census Bureau. With such significant export numbers, economic troubles in the US will certainly have negative effects on China’s economy, especially if those troubles spread to Europe and other markets. In such a case, tight monetary policy would magnify those effects. While a US recession is unlikely to derail China’s growth, the government is already taking steps to stimulate domestic spending, thus reducing the country’s reliance on exports. In late December the government raised the individual income tax threshold, freeing up more money to increase domestic consumption. Once the regulation takes effect, only 30% of wage earners will pay income tax. The government has some options for making up for this lost revenue. One of the most popular of these options would be for the country’s state-owned enterprises to offer higher dividends for stockholders. Some of these dividends will obviously go to private investors, but the largest part of the money will return to the government’s coffers, allowing the government to spend the money that Chinese consumers are sometimes reluctant to. Though the dividends were small, the government began such a dividend-paying practice last year. With more money, the government will increase spending for healthcare, pensions, infrastructure and other social services, especially in China’s countryside, home to more than half of the population. This would stimulate consumption on two fronts. First, the government spending will directly help the economy by employing workers and increasing the purchasing of material and equipment. Second, the spending will improve medical care, pensions, insurance and other social services, freeing up money that Chinese people are currently saving for retirement or for emergencies. Domestic and foreign companies are also finding opportunities in providing insurance and financial services to these less-developed areas. “The whole question of getting development to spread out is clearly very much on the agenda for any corporation that wants to create a successful, prominent China business,” explains Andrew Cainey, head of financial services for the China branch of global consulting firm Booz Allen Hamilton. Cainey points to the examples of companies like Ping An Insurance, which bought Shenzhen City Commercial Bank with plans to court southern China’s rural population, and HSBC, which in December became the first foreign bank to launch a rural banking program. Such moves are increasingly profit-oriented rather than simply attempts to curry favor with the government. “The government, the regulators and the companies are all saying we want to do this in a way that makes money,” he explains. Banks and other financial service companies in particular are looking for opportunities in China’s less-developed regions. Currently, these areas are serviced by informal financial systems where money is borrowed at high interest rates. With higher food prices and government commitments to larger agricultural subsidies this year, China’s rural areas will need more efficient financial mechanisms to manage rising incomes. 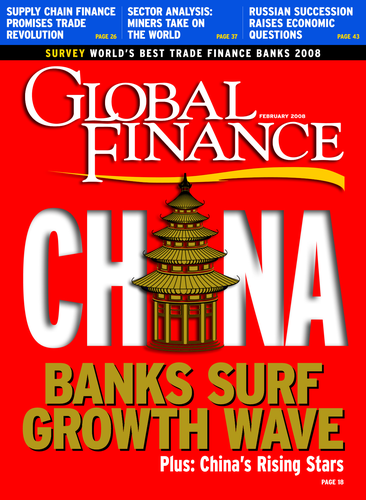 Opportunities lie within that need for China’s foreign and domestic financial companies.